Beloved and I ate at Hap Chan a couple of times the past few weeks. Yep, you heard that right; this one took a while in the making. Why do it like this? Well, it’s sort of an experiment. Basically all of our reviews have been mostly first impressions. While important, I think the most important part is consistency, and visiting again would affirm that. Also, this gives a chance to those places I didn’t enjoy the first time around because of wrong order choices or irresponsible servers or unfortunate mishaps et cetera. So, unless we spent more than reasonable, or the place is very special, expect two visits from future reviews. Anyway, back to the current one. Hap Chan is a Chinese restaurant—one of the more popular ones, in fact. To some people I know, Hap Chan is Chinese food. I’ve been to this place, although a different branch, with family and friends for quite a few times before. However, I was a bit surprised that Beloved never had the chance to visit. Since I recall no bad experiences, it was a pretty safe guinea pig for this two-fold review. I also recall that most of their menu items serves two or more, typical for any Chinese restaurant-slash-tea house. Their prices are also very competitive and quite affordable, if you consider the serving size. During our first visit, I ordered their Lobster Ball Mami (160 Php). Beloved got their Hap Chan Special Hotpot (300 Php) and rice (30 Php) to go with it. 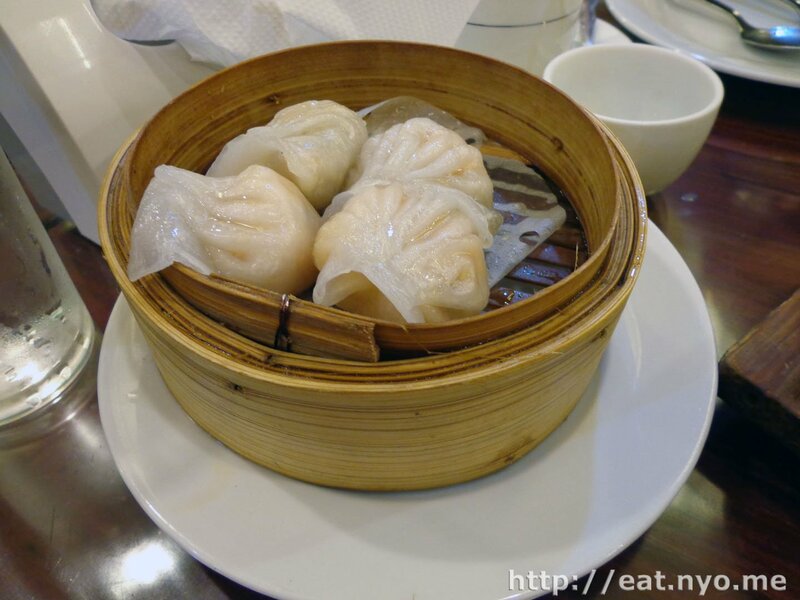 We also ordered my favorite dimsum, Hakaw (95 Php) and my favorite Chinese dessert, Buchi (50 Php). We also got special drinks—Hot Lemon Tea (60 Php) for me and Milk Tea (60 Php) for Beloved, even though they already serve house tea, which I expect from any good Chinese tea house. 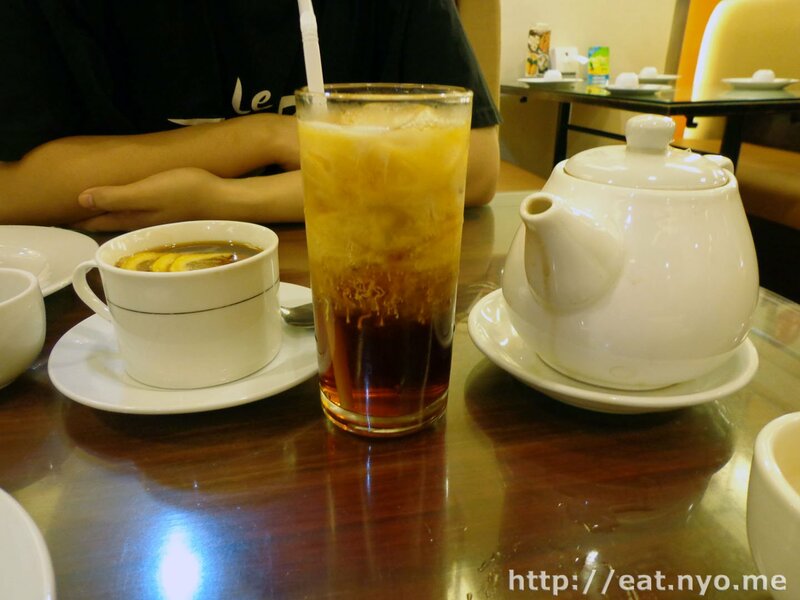 I found their Hot Lemon Tea, despite being the least generous of our orders, which is typical for any restaurant regarding their drink prices, very good. The warm temperature made the sweet lemon drink quite refreshing. I think Beloved also enjoyed their Milk Tea, and it’s actually among the more affordable ones for the size, we’ve had come to think of it. The complementary House Tea should suffice for the frugal. I mentioned earlier that their servings are good for at least two. Even my Lobster Ball Mami, which is priced at a point I expect can only serve one, could do so. Of course, I could also finish this by myself, but I would be pretty full. Although certainly nothing special, with Beloved mentioning that the lobster balls are unauthentic ones that can be bought from the supermarket, it’s certainly filling and isn’t bad at all. Soup was among the milder, but still soothing ones, and the noodles were thin wheat ones that had quite a nice, firm texture. My only major complaint would be the small amount of veggies, which for sharers might find a bit troubling, especially when there are only four leaves of greens to the five balls. Beloved’s Hap Chan Special Hot Pot was honestly among the more less generous offerings I’ve seen this place churn out. Still, it’s certainly good for at least two. It arrived in a hot, stone bowl with an amalgamation of seafood and veggies in thick, savory, sweet and tangy sauce. Among the goodies were shrimp, fish, scallops, mushrooms of different kinds, tofu, and other assorted veggies. Of course, Beloved couldn’t manage all of this by herself, but I’m sure she could manage all the stuff she liked in here, namely the mushrooms and seafood. I have no qualms with their Hakaw. These shrimp-filled dumplings were quite sizable, and filled with whole, scrumptious shrimp.I also found it nice that it wasn’t too sticky or too dry. Good for its price. Personally, the pièce de résistance for the night was their Buchi. No, it’s not really as special as the Hot Pot, which I’ve actually never tried before. It’s actually quite common. However, inside was yam or ube, and not mung bean paste or monggo. And that’s not the reason either, since I actually prefer the monggo one too. 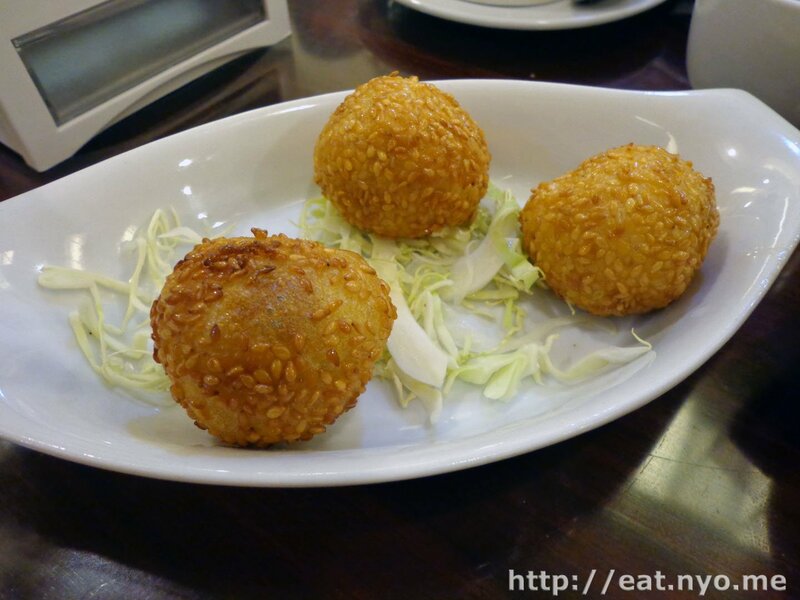 The reason was because Beloved loathes this kind of buchi, which means I get to have all three fried sesame balls all to myself. That concludes our first trip. Our second trip happened a few days after since I needed to buy a new electric fan, but that’s a different story altogether. Anyway, we found ourselves at Ali Mall Cubao’s Hap Chan, again, which brings us to why we decided to do this extended review, and perhaps to all our future reviews as well. Instead of dinner, it was lunchtime, or, more appropriately, afterbrunch. 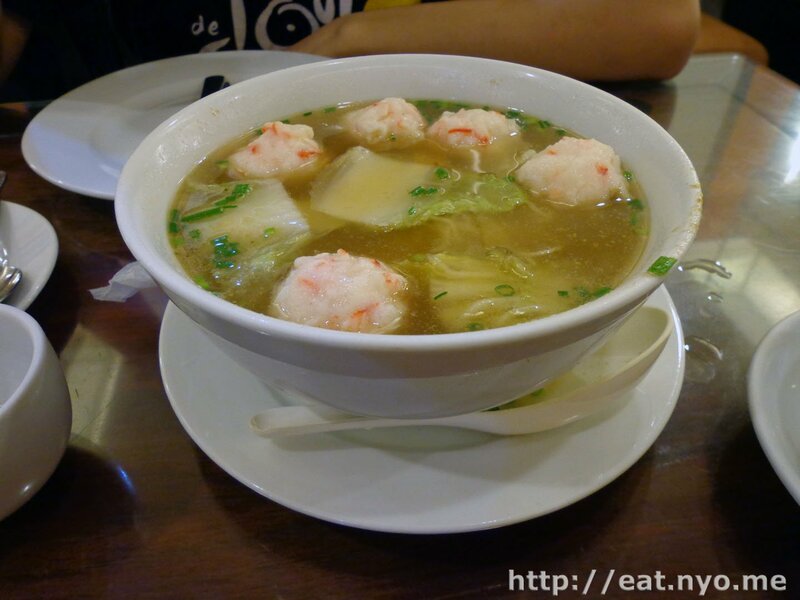 Our orders this time consisted of Polonchay Seafood Soup (200 Php), because Beloved knows that my favorite Chinese soup is the spinach and seafood soup, which is basically what it is. We also got their Chicken and Salted Fish Fried Rice (200 Php) and their Hot Shrimp Salad (400 Php), the latter because I know this is Beloved’s favorite Chinese dish, according to her. Finally, we also got their Roasted Pork Asado (180 Php) just in case the hot shrimp salad didn’t turn out as expected. The Polonchay Seafood Soup turned out as good as I wanted it to… except for one detail. 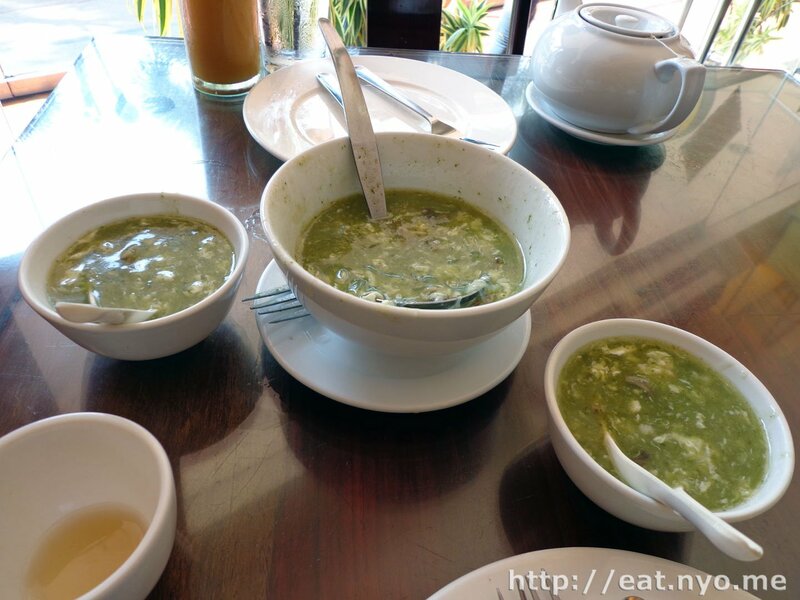 The thick, green broth had a nutty and slightly tart taste to it and the bits of seafood added into it gave it some depth and wonderful various textures. The only thing I didn’t like about this is there was glass noodles added into it. Now, many will perhaps enjoy this string addition, but the one I really like forgoes this. Still, it was very good, and we managed to down the entire bowl, even though this, which was the smaller of two serving options, could’ve easily serve at least four. Our order from their roasting selection, their Roasted Pork Asado, turned out quite okay too. This marinated pork had a very sweet and slightly soy-salty taste to it, with sesame added to heighten the flavor. Due to its sweetness, it went very well with our rice. 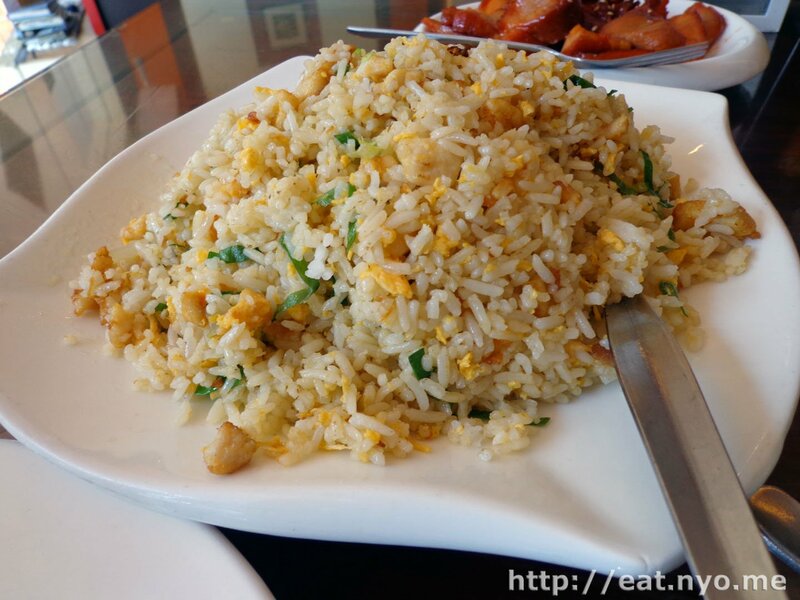 Our choice of rice, their Chicken and Salted Fish Fried Rice, had a similar serving size to our soup wherein it could easily serve four normal people. Aside from the Chinese fried rice staples of green peas, carrots, and egg, it also had the aforementioned bits of salted fish in it and tender chicken, making it saltier than your normal fried rice. This would go well with the sweeter entrees, such as what we ordered, and any of the Chinese “sweet and sour” dishes most Chinese restaurants carry. Our mystery order, the Hot Shrimp Salad, didn’t really turn out as what we expected. Beloved claims that “real” hot shrimp salad is hot shrimp with veggies and mayonnaise. This had… fruits. This is basically a fruit salad with shrimp in it. In fact, it wasn’t really that hot. 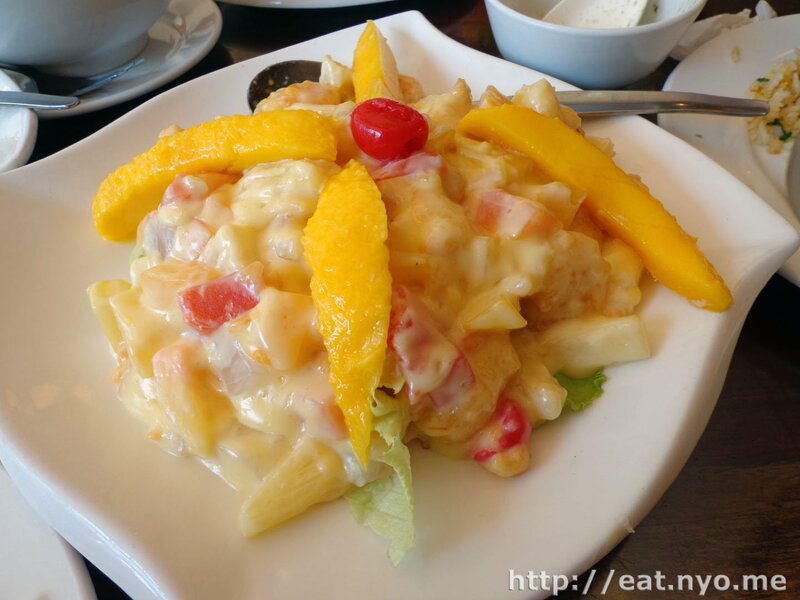 Confused, we looked at the menu to find “shrimp fruit salad”, but the picture confirms that our order was correct. It was… interesting. This certainly felt more like dessert than a dish that goes with rice. Ironically, since we ordered salty fried rice, it was actually a pretty decent combination once you get over the fact that you’re eating fruit salad with rice. Beloved didn’t enjoy it as much, since the “real” hot shrimp salad she knows should taste more shrimp and less fruit. However, I found it very interesting and also not bad at all after a few bites. However, I wouldn’t call this a really great value. Although there was a lot of shrimp in the dish, I felt the 400 Php tag was relatively more expensive compared to all our other orders. Although, like the rest of our orders today, this could easily serve four. After further research, I learned that “real” hot shrimp salad really was what we got. However, Beloved disagrees. She now vows that she will make me taste “real” hot shrimp salad. When that happens, I’m sure to let you know. But back to our verdict: overall, it was not bad at all. I certainly won’t be like some of my family and friends that equate Hap Chan with Chinese, but I will certainly keep this place in mind when I’m in a larger party. Four seems to be a great number where you only need to order a dish once. Any more might net some people not being able to savor the dishes. 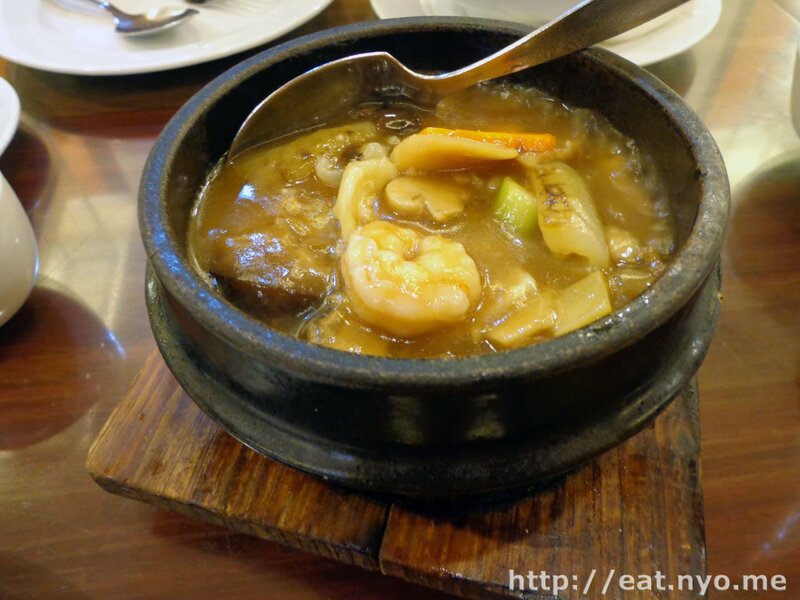 There’s also a lot of dishes to choose from, and their hot pots might just be their specialty. If you’re alone, perhaps a noodle dish would be good, and if you’re in a date like us, one viand with would be enough. I don’t really know if I’ll actually crave for this place, since there really wasn’t anything special here over other Chinese places we’ve been to. However, don’t take the last sentence meaning this place is bad: Hap Chan is certainly worth a try or two. 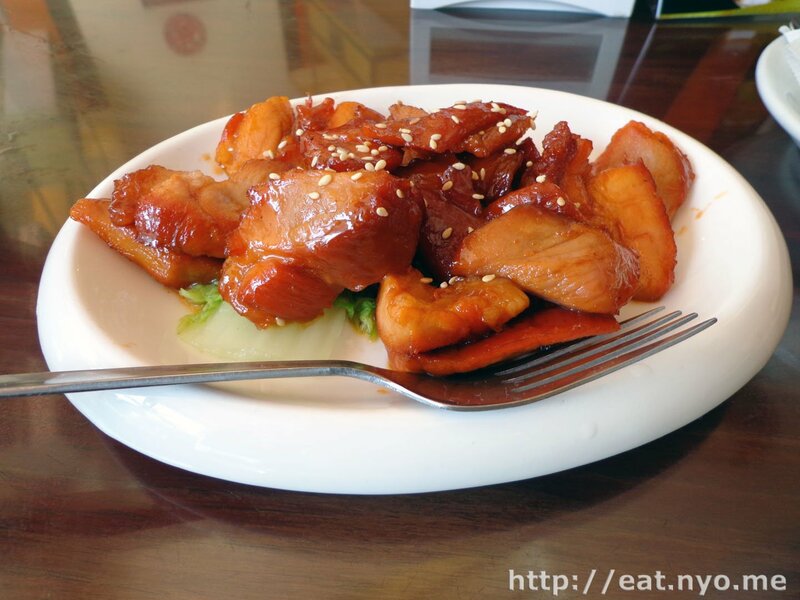 Recommended for: Hungry Chinese food lovers. Not recommended for: Not-so-hungry Chinese food haters. Smart nomnomnom tip: All of their food is good for sharing. Do not go here if you’re alone and not very hungry.